If you live in an urban setting or don’t have a yard, your garden may have to fit into an area that doesn’t have dirt, such as a deck or patio. To make that happen, you’ll have to plant your seeds in containers. Container gardens fit just about anywhere and come in a variety of shapes and sizes. To make the most of your limited area, plant vertically. Planters that hang from your walls, railing or ceiling are ideal, as these don’t take up floor space. Otherwise, try stacking containers to make the most of your vertical space. Keep in mind that some plants require larger pots than others. What’s more, small containers will require you to water your plants more often. Once you decide which produce you want, research how large of a container they need – some produce will need bigger pots than others. Additionally, tomatoes need wiring or wood stakes on which to climb as they grow, so they aren’t ideal for stacked containers. Now that you know that you can plant more vertically in a small space and know which plants will grow well in pots, you can plan your space. How much area do you want devoted to gardening? If your goal is to grow herbs and vegetables for cooking, then giving the majority of your porch to those plants is perfect. However, if you want an outdoor retreat, then leaving room for seating and surrounding it with mood-boosting flowers is your best move. Additionally, place plants that need lots of sunlight in open areas and store those that like shade beneath your roof. Having a mix of plants that like direct and indirect light will help you get the most use out of your space. Choosing all of one or the other will mean some plants don’t grow well or at all, unless you only get all sun or all shade. Finally, consider which plants are in season and whether you’ll need to rotate produce throughout the year. While you’re waiting for your container garden to grow, you can enjoy fresh-cut flowers both inside and outdoors. 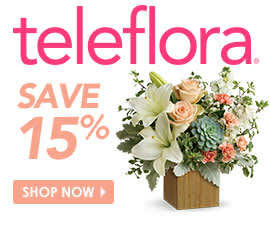 Teleflora’s array of spring bouquets are the perfect decor piece to brighten your space and inspire you when planning your garden. For instance, the Garden Delights bouquet features carnations, roses, chrysanthemums and greenery in a wooden box. The bright colors and cheerful blooms might just give you an idea of what to plant. Good luck with your outdoor garden! Just remember, no space is too small to start growing your own plants or flowers. Start slow and then continue building once you succeed. This is a lovely post, but you only showed pictures of your cut flowers. This post really needs multiple pictures (or one very inclusive picture) of exactly the type of container garden(s) you are discussing. I agree with Sheri Wilson , u need more pictures of what porch will look like with lovey planted pots around and the use of vertical space. Perhaps a combination of flowers versus vegetables to fill both needs of beauty and culinarily delight would be lovely . The article is very interesting, but it would be great if you could add more examples, realistic images of the spaces that are designed flowers, trees that you have been through. Thank so much, Perhaps a combination of flowers versus vegetables to fill both needs of beauty.